Lego playsets are not just a toy for boys anymore. With the popular line of Lego Friends toys, girls are now able to get in on the fun. The Lego Friends Heartlake City Pool is another in one of the dozens of the Heartlake City series that also features stables, a veterinary clinic, a beauty salon and more. 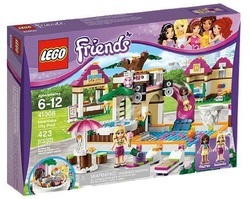 The entire line has had generally good reviews, so find out if the Lego Friends Heartlake City Pool follows suit. Numerous accessories including food pieces, money, and separate buildings. Overall, everyone who purchased the Lego Friends Heartlake City Pool loved it - both the children and the adults. The set is recommended for ages 3 and up because of the small pieces, but as for the actual assembly, a 6 or 7 year old could probably put it together with very little, or no adult assistance. The set features the main pool, water slide, jacuzzi and lounge area. 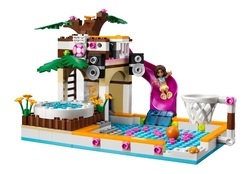 There are quite a few details that make the Lego Friends Heartlake City Pool all that more fun, like a stereo system and basketball with basketball hoop. Apart from the main pool area, there is a snack hut and also a separate bathroom and shower stalls. The details are truly amazing; you can see the hot and cold water knobs, a unisex bathroom sign, small snacks and drinks for the two girls to enjoy, money, purses, table and chairs, beach chairs and more. As for the quality of the product and the enjoyment that the children had playing with it there were absolutely no complaints. The only small issue is that there are a lot of small, or flat, building blocks. If your children like to put their Legos together and leave them that way, it is not a problem. However, if your children like to build, take them apart and then build other structures using the pieces, that may be difficult. The easiest way to remedy that problem is to invest in a Lego separator. They are not too expensive, easy to use and will save you a lot of time and frustration. 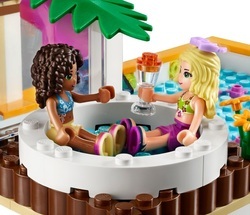 In short, the Lego Friends Heartlake City Pool is sure to please any little Lego lover.